It was surprisingly difficult to find normal values for Heart Rate and Blood Pressure. Different authorities cite different normals. We used an average of the values cited. Cats are much better survival machines than they are patients. In a vet’s office, a cat’s respiration, heart rate and blood pressure may all be elevated as the cat goes into ‘fight or flight’ preparation mode when put in an unfamiliar or stressful situation. Ask your veterinarian to do a major renal panel if you think your cat has CRF symptoms. If your cat is age seven or older, have your veterinarian check for CRF during the cat’s annual exams. A Complete Blood Count (CBC) examines red and white blood cells and a Blood Chemistry Test checks electrolytes, BUN, creatinine, cholesterol, glucose, liver enzymes, etc. Together, these two tests, along with a urinalysis, will provide enough information for the veterinarian to determine if your cat is in CRF. Creatinine and BUN are the two most important elements of the blood test for cats with CRF. When these are elevated and the urine is dilute, there is a very real possibility that the cat is in CRF. When the creatinine and BUN are elevated, it is likely that approximately 70% of kidney function is already gone. Since low normal potassium levels, dental disease and high blood pressure are now suspected to be linked to the development of CRF, it is advisable to have these conditions checked, too. While lab results are certainly indicative of the progression of CRF, it must be remembered that there can be variations on blood tests – different labs can produce somewhat different results from the same samples because of standards and testing methodology. The manner in which the blood was taken may affect the results of blood work testing. How gentle the technician is, from what vein the blood is taken and what size the needle is can all have an effect on test results. Whether or not the animal is severely stressed can affect the results as can when and what the cat ate and when the cat was last hydrated. In some cases, drugs given to a cat within proximity of taking blood can affect results. What is normal for one cat may not be normal for another. You look for trends and then at the long-term trend. We have found, after becoming frantic over lab results, that how the cat is acting is equally important. A friend of ours, who took care of a CRF cat for several years, gave us this valuable advice – “Treat the cat, not the lab work”. Blood tests are just one piece (albeit a very valuable one) of the diagnostic puzzle. Always request copies of the lab report from your veterinarian. From this information, a chart or spreadsheet can be created to record results of each blood test. From this chart, you and your veterinarian will be able to see the entire history at a glance. Become familiar with the normal limits for various blood values. These numbers are usually given on the lab report and may vary slightly from lab to lab. Having blood drawn is very stressful for a cat and its caregiver(s). It takes a while to replenish even what seems like a small amount of blood and unless there is a discernible rapid downward trend or there are clinical symptoms of a problem or a worsening of the cat’s condition, think twice before having frequent blood work done. If you get two blood tests in a row that are pretty close in the values there is no need to put the cat through the stress every month. The negative effects of the stress could offset anything to be gained from the more frequent lab work. Also, the more often you take blood, the tougher the cat’s veins and skin will become. Later on, as the disease progresses and you need to take more frequent blood samples, it will be difficult to find a good site to insert the needle because of the scar tissue. When you do have blood tests done, request complete panels in order to benefit from as much information as possible. If your cat doesn’t cooperate with jugular sampling, it may be easier and less stressful to take blood from a leg. You may reach a point when both you and your veterinarian feel that additional blood tests won’t serve any useful purpose. If your cat is anemic, the value of periodic blood panels may be outweighed by the risk of drawing blood that is not easily replaced. Obviously, the interpretation of blood tests and urinalysis can only be done by a veterinarian. However, the following minimal information may be helpful in your understanding of what all those numbers and words on the lab report mean. Some vets feel that slightly elevated Amylase levels can sometimes be a pre-cursor to CRF before other symptoms occur. BUN is a waste product excreted through the kidneys. BUN is more reflective of dietary impacts than creatinine. An increase in BUN can also be due to dehydration (a symptom of CRF and many other diseases and syndromes). Increases in cholesterol levels may occur with kidney disease. Creatinine is a waste product excreted through the kidneys. It is indicative of overall declining kidney function. A healthy cat will have a calcium to phosphorus ratio of 1:1 to 2:1. Since damaged kidneys cannot adequately process phosphorus, calcium levels must rise to compensate. This number is watched carefully as it is indicative of anemia which is common in CRF cats. In this test the blood sample is centrifuged to separate the blood cells from the fluid portion (serum) of the blood. The volume of the cells is measured as a percentage of the total sample. Normally, 40% of the cat’s blood consists of cells and the rest is liquid. During CRF, high levels of phosphorus accumulate in the blood (hyperphosphatemia) because the kidneys can no longer efficiently excrete it. Excess phosphorus intake can make CRF worse. Phosphorus levels should be monitored on a regular basis. Potassium levels are critical in CRF cats and should be regularly monitored. Potassium loss can result from frequent vomiting and in urination. Sub-Q therapy may also dilute potassium even further. Low potassium is called hypokalemia. Even if your cat’s potassium is in the low normal range, it may be necessary to give him a potassium supplement. This is because with CRF, critical stored potassium in the tissues is used, often making the blood analysis appear normal. Sodium should be monitored closely as the kidneys of CRF cats are unable to excrete sufficient quantities of it. This may result in hypertension. The values in the table are in US units. The LabQuest Biochemistry Unit Conversion page will help you to convert from US to International (SI) units or vice versa. Blood gases are normally checked by a specialist as regular veterinarians usually do not have the facilities for this type of testing. The specialist may either have the capability to test in-house or will use a local hospital for testing. If blood gases aren’t normal, it is usually possible to make adjustments with medications. 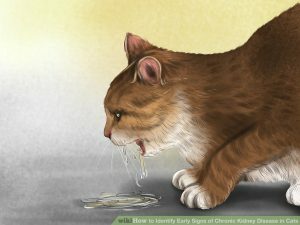 This test is done to determine if the cat is a candidate for Calcitriol. This test is an accurate measurement of the production of new red blood cells. CRF cats tend to become anemic and a retic count will tell you how effectively and at what rate new red blood cells are being pumped out of the bone marrow. The retic count will really become significant if the red blood count goes down. Hyperthyroidism, an abnormal increase in the production of the thyroid’s hormones, is a very common problem in older cats and occasional T-4 tests should be done. Urinalysis is a series of chemical and physical tests, the results of which indicate the specific gravity and pH of the sample and the presence and level of blood, glucose and other components of the sample. Since the major CRF data comes from blood tests, it’s not necessary to have urine tests done quite as often.Specific gravity is an important measure of how well the urine is being concentrated by the cat’s kidneys, and therefore, how well the kidneys are actually functioning as filters. CRF cats cannot adequately concentrate urine so a low specific gravity is indicative of renal failure. The normal range for specific gravity is between 1.015 and 1.060 but only concentrations higher than about 1.030 can be considered solid evidence of normal kidney function. It is a good idea to have a urine culture and sensitivity test done at the same time as the urinalysis, particularly if bacteria is detected in the sample. Renal failure can sometimes be a result of a kidney infection. If an infection is present, the culture and sensitivity test will show what type of bacteria is present and allow the vet to treat it with specific antibiotics. A test distributed by IDEXX Laboratories allows veterinarians who have an IDEXX VetTest Chemistry Analyzer to measure Proteinurea and Creatinine from urine samples and use the measurements to calculate the ratio of creatinine to protein. The manufacturer says that the Urine P:C ratio can be used to diagnose CRF much earlier than the currently used testing methods and that the ratio of protein to creatinine is indicative of the seriousness of the disease which would permit the veterinarian to make a more accurate prognosis. For additional information, please visit the IDEXX Laboratories website. A urine test (E.R.D. HealthScreen Feline Urine Test) has been developed by Heska to detect the presence of microalbuminuria (small amounts of albumin) in feline urine. The presence of albumin in the urine is an indicator of glomerular damage associated with renal failure and/or other underlying conditions causing albumin to leak into the urine. This tool is the only test that will detect albumin leakage and may provide an early diagnosis of kidney damage long before conventional BUN and Creatinine become elevated. For additional information, please visit Heska’s website. Two common ways of taking urine samples at the veterinarian’s office are cystocentesis (a very thin needle is inserted through the skin into the bladder and an uncontaminated urine sample is obtained) and by expression, in which the veterinarian puts external pressure on the bladder causing the cat to urinate. Cystocentesis is the most accurate, cleanest way of obtaining a urine sample and is probably less painful for the cat than the expression method.If you are not comfortable with the methods listed above, you might consider taking the urine sample at home. If your cat will cooperate, you may be able to use the free catch method. Hold a sterile plastic container under the cat when it urinates. A second method is done with plastic pellets. Check with your veterinarian to see if you can obtain this product. Many cats will use the litter box with these pellets rather than litter. After the cat has urinated, drain the urine from the litter box into a jar. If your cat will urinate in an empty litter box, this is yet another alternative. With all of these home methods, the urine must be refrigerated until you can take it to the veterinarian’s office (this must be done within a few hours) and there will probably be bacteria included with the sample, from the litter box and from the external cat. Recently (2007), a product called the Smart Cat Box has become available. This unique type of litter box enables the caregiver to easily collect a urine sample for testing. A biopsy is the most certain method of obtaining direct evidence of the state of the kidneys. However, biopsies can be somewhat dangerous procedures and may not add much to the diagnostic picture. If a biopsy is to be done, have a blood clotting profile(or coagulation test) done beforehand. Sedation or anesthetic may be required. Be sure there is a blood source for transfusion in case of unexpected bleeding during the biopsy procedure. Blood pressure can be checked as a means to find out if hypertension is present. Some veterinarians do not have the equipment or specialized training to take blood pressure but it is becoming a routine test for CRF cats. A veterinary specialist may need to be consulted to perform blood pressure monitoring. Unlike BUN and serum creatinine tests which do not register deterioration of kidney function until 70% or more of nephrons are non-functional, the GFR (Glomerular Filtration Rate) test is directly related to the functional renal mass and thus can give a much earlier indication of renal failure. There is currently no recommended protocol for using the GFR test on a routine basis in healthy animals. The value of early detection, however, increases as drug and other therapeutic measures are improved. This suggests that the test may be of some positive benefit as an adjunct to an annual physical for adult cats. Essentially, the GFR test measures the rate at which the kidneys clear a tagged substance from the system. While the clearance rate of creatinine or insulin can be used, the new standard for GFR testing is iohexol. Iohexol is a radiographic substance developed for use in many diagnostic procedures. It is entirely excreted by the kidneys through the process of glomerular filtration. Measuring the amount remaining in the system at carefully measured intervals can give an accurate measure of the mass of functioning kidney tissue. The test is performed by administering a single intravenous dose of iohexol at 300mg/kg. The time of the administration is recorded to the nearest minute. Three to four ml blood samples are then drawn two, three and four hours after the administration. The samples are labeled with the owner’s name, animal I.D. and time of sampling. The blood is allowed to clot and the serum samples are transferred to plastic vials labeled with the exact sampling time. The samples are chilled and shipped to the testing laboratory where the concentration of iohexol will be measured. By extension, these measurements will be used to calculate the functioning kidney mass. An ultrasound will tell you the condition of the cat’s kidneys (whether normal or shrunken) and will give you a baseline for the future. Ultrasounds are certainly not stress-free for the cat, but they are non-invasive, rarely require sedation or an anesthetic to perform the procedure and there is no radiation danger. Your cat’s fur will be shaved in the area where the ultrasound is being done. Not all veterinary offices are equipped to do ultrasound testing and you may be referred to another facility. Note – An ultrasound was the only reliable test for early detection of PKD (Polycystic Kidney Disease) in cats until just recently. UC Davis has identified the gene mutation that causes PKD and now it can be detected with nearly 100 percent accuracy. PKD ultimately leads to kidney failure. Science Daily reports that a new biomarker called ‘SDMA’ has been developed that can provide earlier identification of chronic kidney disease in cats. As of December 1, 2014, the test is not yet commercially available. Copyright © 2019 Feline CRF. Powered by WordPress. Theme: Accelerate by ThemeGrill.